I’ve been a Rodney Crowell fan since 1978. He is, to be blunt, one of the great American songwriters of the last 40 years and I have listened to his music for 1000s of hours. What little guitar playing I learned, I learned so I could play Crowell’s songs. During the 70s and 80s Nashville artists waited for new Rodney songs to record. He has also recorded seventeen LPs (or CDs) since 1978, charting eight Top Ten Country songs, including five consecutive #1 hits, in 1988-89. 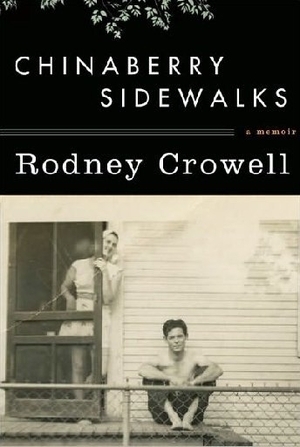 Crowell has written a memoir about his early life growing up in hardscrabble Houston, Texas in the 1950s. Crowell’s former wife, Rosanne Cash, published an amazing memoir last year, Composed, which was less a memoir of her public life, than an intense meditation on how her life influenced her artistically. I was hoping for something like that from Crowell, but not this time out. It is a study of his life as a child, and tells the story of his parent’s life more than his own. Most reviews are giving the book a home run … I have to differ. First of all, it is written in too much of a folksy, aw shucks style, peppered with down home expressions that most of us heard while growing up, but left behind as we moved out into the world. Crowell and his editor obviously had never read the old adage, “a little bit goes a long way.” It also is a bit clunky at times jumping from chapter to chapter, back and forth in time. There is an endless chapter about attending pentecostal church meetings that wears out its welcome after the first 2000 words, but goes on and on and on. Here’s hoping Crowell has another memoir in the works that will illuminate his professional career as a songwriter and musician. Until then, I recommend you pull out your copies of Diamonds & Dirt or Fate’s Right Hand and enjoy the music! JONES: I understand why you wrote your first book, Haunted Savannah. You are a Savannah tour guide and operate a ghost tour business, so the book was a natural extension of your research for your tours. What inspired you to expand your research to other cities? CASKEY: I’ve always been a storyteller. When I was younger I was an artist—I actually went to art school, and even in that creative medium, my paintings had a strong linear narrative. My art told historical stories, even the portraiture. Then in 2001 I got introduced to the world of guided walking tours, and it was just a natural fit for me: I had already been telling ghost stories for years, and it was sort of funny that there was this flash like: Wait, I can get paid for this? I had been researching ghost stories even before I opened Cobblestone Tours, and what I found surprised me: not only were most of the ghost stories which other guides were telling as accepted truth sometimes wrong, but their history was frequently way off base, as well. The nighttime tour landscape back then was dotted with fictional tales of monsters (presented as fact) that lived in lairs under the cemetery, that sort of thing. I wanted to do better than that. 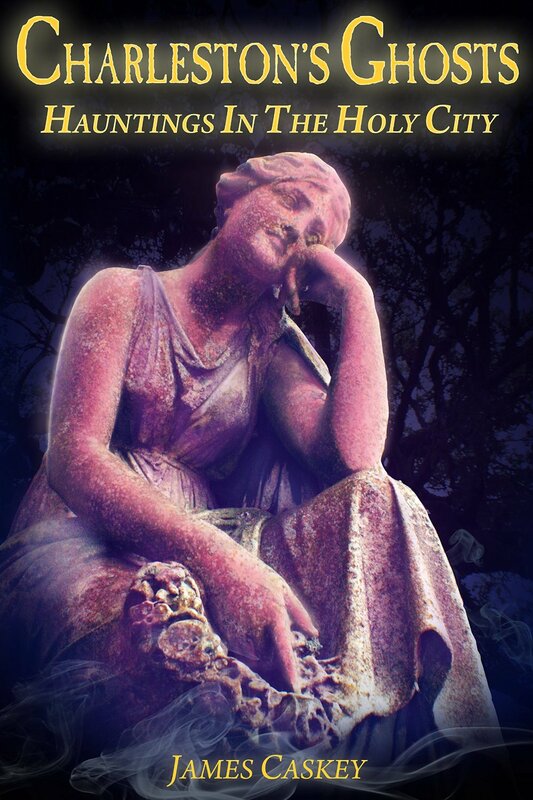 I began writing initially as a way of giving my own employees a study manual for their stories, my version of ‘Cliffs Notes for Ghost Tours.’ I found that I really enjoyed the research aspect, and loved sharing the stories because the true history was so much better than the bogus folklore, most of the time. True life is almost always better than fiction. Well, my little hobby grew from there. I was three years into this process when I realized I was writing a book, a volume which eventually became Haunted Savannah. It published in 2005. This is a very roundabout way of explaining that once the Savannah book was in stores, I really missed that ‘researching and writing’ process. It took me a long time to muster up the courage to tackle another major writing project. Once I decided to do it, though, I really wanted to engage a city with which I was completely unfamiliar. I mean, New Orleans is over eleven hours away by car, one way, and I knew very little about it. It was a big leap. The book is very much about that journey and exploration, and fortunately I get a lot of feedback from readers that they find that level of honesty refreshing. There was definitely a fear of failure, and some moments of confusion, mixed in with the joy of unveiling an exotic and personally unknown place. New Orleans has some great stories. JONES: Your books are as much history as they are ghost stories. What are the major problems you encounter in this type of research? CASKEY: Well, you have a certain type of person who prefers the erroneous folklore: some just really want their pre-conceived notions confirmed. However, the documented history I present in my books is unvarnished, and often less tidy than the version you might hear on a ghost tour. It can be an uncomfortable thing, to eviscerate a legend that another person believes as fact. I know from our discussions that you experienced the same exact thing regarding Lavinia Fisher when you wrote Wicked Charleston—the fictionalized wedding dress, the erroneously high body count, etc. People will really argue for the campfire tale sometimes, even if you can back your assertations up, point by point. I want to present both sides: the legend AND the facts. If people just want a recounting of the bogus folklore, well… those books are already out there. Don’t get me wrong, I love a good story and folklore can be very entertaining, but you’re also going to learn the truth from my books. I don’t research and write to satisfy people’s expectations: my writing is really a process of discovery. JONES: Why did you choose Charleston as the subject for your third book? CASKEY: Charleston SC is one of the most tragic and historically violent places in North America. It is haunted by more than just ghosts: secession, slavery, great fires, yellow fever, and a uniquely brutal timeline. There was no question whether or not I was going to write about it, the only question was when. JONES: Are there major differences in the paranormal history between New Orleans, Savannah and Charleston? If so, what are they? CASKEY: Honestly, I’m more fascinated by the similarities. Each location once had a huge Native American population, if you go back to before their contact with Spanish and English explorers. There was a horrific genocide in the American South, starting in the mid-1500’s, on a scale which is scarcely conceivable today. The American Indian populations were largely eradicated. All three towns had their formation shortly after that cauldron of disease, war, and death. It’s no wonder so many Southern seaport cities have such haunted reputations! JONES: What was your favorite Charleston ghost story before you wrote the book? Is it still your favorite? CASKEY: I probably liked the Old Exchange and Provost Dungeon the most, going in. I still love it, but there are other stories which sparked my interest a little more, like Madame Talvande and the Sword Gates on Legare Street. Charleston has such a wonderfully twisted history, and is a fertile ground for storytellers. JONES: What was the most surprising story you uncovered during your research about Charleston? CASKEY: There are more than a few good candidates, but I would have to say that the story that most surprised me was the Tavern on East Bay. It’s just this tiny little liquor store; looking at it from the outside, one would never expect the supercharged ghost story it holds within. I talked to owner Gary Dow for hours, and it was by far the most entertaining day I’ve ever had as a researcher. The real surprise was his attitude toward the supernatural things happening to him on a nearly daily basis: he is fiercely protective of his ghosts. If you think the TV program ‘Ghost Adventures’ is the way to deal with spirits, you know, taunting and aggressive, well, Gary will politely take you to school on that subject. He likes his ghosts, and by every indication, the feeling is mutual. JONES: What is the most haunted location in Charleston, and why? CASKEY: I would have to say that block on Queen Street between Meeting and King is the most haunted, if you’re asking about concentration of stories. The Mills House, Poogan’s Porch, and Husk all have stories. Following a hunch, one day I had lunch at 82 Queen in that same block, and I casually asked my server if that spot was haunted. He looked at me like I was crazy and said, “Yes, of course it is.” I do know that area burned in the Great Fire of 1861, so perhaps the high number of hauntings in that area has something to do with that tragic event. JONES: Any plans to research and write about other cities? CASKEY: Yes, although I plan on taking a little break, I definitely would like to continue writing. There are a number of cities on my haunted hit-list. JONES: Other than reading your new book, what are some of the must-do things to do during a visit to Charleston? CASKEY: Eating and drinking have to be high on the list for anyone visiting Charleston. It’s a city famous for its food and hospitality. During one of my research trips while writing the book, I observed a family checking in to the hotel that had packed coolers full of cheap processed lunchmeat and sodas, and I couldn’t help but think that they were missing a major component of their vacation. It was oddly sad. To me, to not partake of the local cuisine would be like visiting Nashville (Music City) and only listening to ‘bubblegum pop’ the entire time. Other than that, I’d recommend taking a cultural tour of Charleston. Try a carriage or walking tour, and a couple of different house museums or heritage sites. The Old Slave Mart Museum on Chalmers Street is especially worthwhile. Oh, and you simply have to experience sunset at a rooftop bar. The view of the church-steepled skyline is pretty spectacular. Contact James Caskey at JamesBCaskey.com. To take a Savannah ghost or pub tour, contact GhostSavannah.com.